After the release of my new CD, I’ve been able to take a little breather. It’s been nice, after spending a lot of my free time over the last year in the recording studio. And it occurred to me, for so many years I’ve been working so hard at writing and performing my own music, I sometimes forgot how good other people’s music is. I know that sounds goofy, since – if you’ve heard my music – you know it’s not as though it’s the best music in the world. Obviously, there’s better music out there. Mine is just my own contribution to the world of music, and that’s ok. But I’ve been listening to some newer music by other artists and it’s a little like I’m hearing music with new ears. Having completed this latest CD project, all of a sudden I don’t have anything to prove. I’ve done it – done my best – and it’s out there. And there’s no threatening feeling if I hear music that’s better than mine. It’s true what they say: God gave us two ears and one mouth, and that means we should listen twice as much as we talk. Or sing. And that’s a liberating thing. One of the new artists I’ve been listening to is Toby Mac. His CD Eye on It is one of the best all-around albums I’ve ever heard – I’m talking lyrics, melody, production, all of it. Including the intangible stuff that we don’t really have a name for. Heart? Whimsy? I don’t know, but it’s there. Definitely check out this CD. One of my favorite songs is called Forgiveness. Check out the YouTube video with the lyrics here. Ultimately I think the song is about the peace that comes from forgiveness. And isn’t that what we’re all after – peace? Incidentally, my own humble attempt at writing a song about peace is called (cleverly) Peace. You can see the video of a live performance here (though I was about 40 pounds heavier then, but that’s a subject for another week’s blog). Anyway, the studio version of the song is on my new CD. 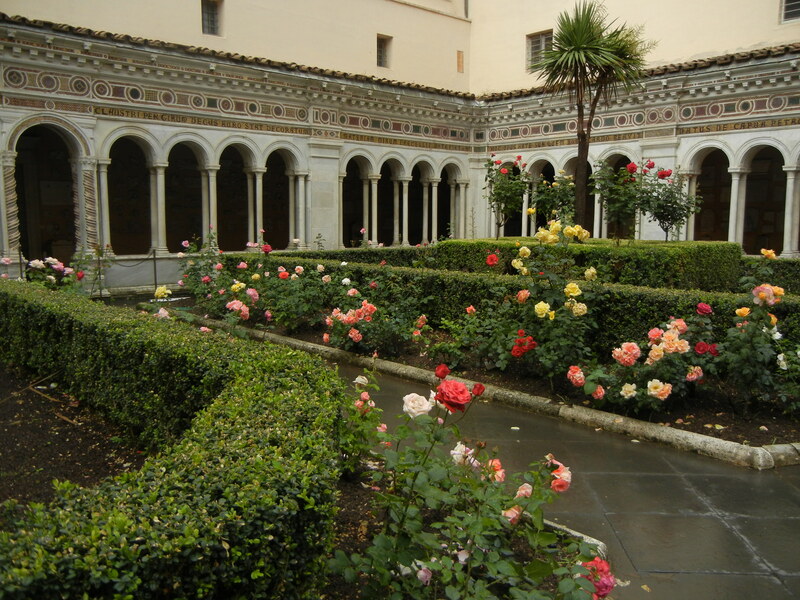 Most tourists never go into the cloister, so it’s usually relatively deserted. Quiet and beautiful… in a word, peaceful. 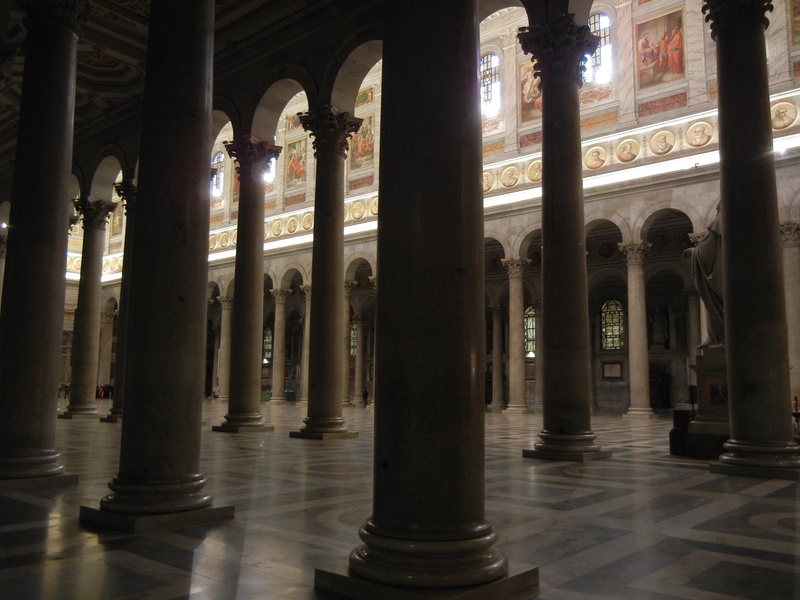 The interior of San Paolo is also very peaceful, if you go early in the morning before the crowds get there. This shot does a good job of demonstrating what I’m talking about, and it became the back cover of my book on Rome. Why is it that peace is so illusive? I think part of the reason is that we don’t take the time or effort to find it. You don’t have to go to Rome to find a peaceful spot, but you do have to go out of your way – and step out of your daily routine. You can make a peaceful spot in your home, so you don’t even have to leave the house, but you do have to set aside some time to use it, or you won’t get the benefits of your peaceful place. Just looking at something peaceful isn’t enough. We have to be surrounded by it – which means getting off the hamster wheel of our weekly business and relax. I’m not saying I’m good at this, but when I do take time out for peace – to pray, read Scripture, etc. – I don’t feel guilty about it. And neither should you. By the way, if you want some pure and simple encouragement for listening and for taking time out for being peaceful, check out an indie film called The Letter Writer. It’s on Netflix, and it’s only about an hour and a half long. Don’t look for perfect acting or superb production values. Just watch it for the message. You’ll be glad you did. And it’s a family-friendly film, so make the kids watch it, too. I encourage you to set aside time and a place for you to rest and recharge your spirit. It’s not an optional part of the pilgrimage – it’s not a detour – it’s more like stopping for gas on a road trip. If you don’t do it, you won’t be able to stay on the road. Before I close, here’s another picture of Saint Paul’s in Rome – just because it’s such a beautiful church (for more photos of Rome and its churches, check out Romesick Photography). God of our Lord Jesus Christ, Father of Glory, give us a spirit of wisdom and revelation so that we may understand you better. Illuminate the eyes of our hearts so that we may know the hope of your calling, the richness of your glory, and the inheritance of your saints… Fill us with the knowledge of your will through all spiritual wisdom and understanding so that we may live in a manner worthy of our Lord, to be more fully pleasing to you, bearing fruit and growing in the knowledge of you. Strengthen us with power according to your glorious might, for all endurance and patience. With joy, we give thanks to you, Father, for making us fit to share in the inheritance of the saints in light, for delivering us from the power of darkness and transferring us to the Kingdom of your beloved Son, in whom we have redemption through the forgiveness of our sins. Amen. (St. Paul, adapted from his letters to the Ephesians and Colossians, first century. This entry was tagged Cloister, Forgiveness, Peace, Rome, Saint Paul, St. Paul, Still Quiet Voice, Toby Mac. Bookmark the permalink. 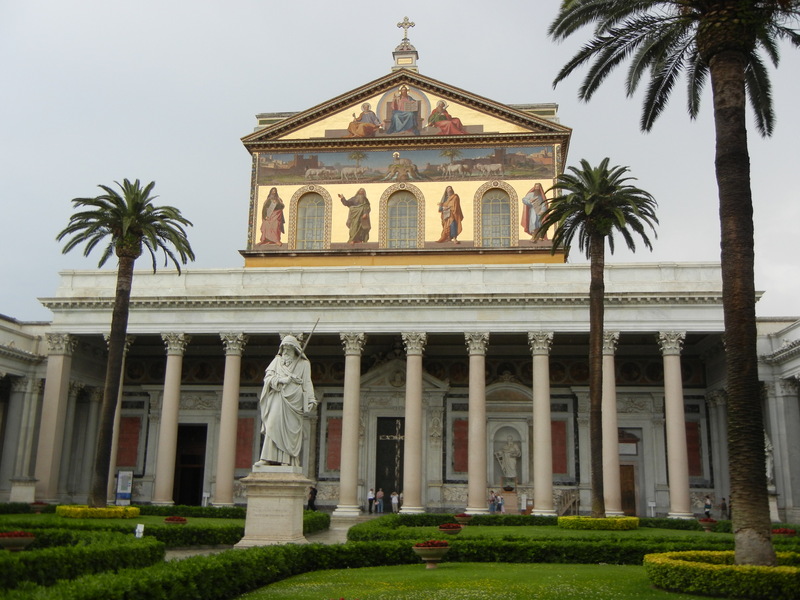 Hey Jim, St. Paul’s Outside the Walls was by far my very favorite church in Rome the one and only time I ever visited the Eternal City (I was in high school, so this was some time during the Barbarian Invasions). St. Paul’s — how prophetic can you get? Do you think he spied me and filed me away for future reference? Thanks for posting these photos, brings back memories.